With Holland America cruises you can see the world, quite literally, with their plentiful itineraries that cover every corner of the globe. Here are the top 10 you won’t want to miss. 1. A Holland America Alaska cruise takes you on a 7-night trip roundtrip from Seattle where you visit Puget Sound, cruise the Tracy Arm Fjord, and stop in Juneau, Sitka, Ketchikan and Victoria. 2. If the Mediterranean is calling, check out the 12 night Mediterranean Romance cruise from Venice to Barcelona. This stops in Dubrovnik, Kerkira, Argostoli, Thira, Catania, cruising the Strait of Messina, Naples, Civitavecchia and Livorno. 3. The great Holland America cruise ships, like the Prinsendam take you on an Iberian Explorer, from Amsterdam to Barcelona; enjoy stops like Lorient, Bordeaux, Leixoes, Cadiz and more on this 12 night adventure. 4. Holland America cruises along the eastern US and Canada includes the 7-night trip on the Veendam from Boston to Montreal. Stops in Bar Harbor, Halifax, Sydney, Charlottetown, cruise the Gulf of St. Lawrence, Quebec City and cruise the St. Lawrence River. 5. For an 11-night Ancient Discoveries trip aboard the Ryndam, look no further than the roundtrip from Barcelona that stops in such places as Palma de Mallorca, Cagliari, Valletta, Livorno and Monte Carlo, among others. 6. Holland America cruises to Hawaii go from Vancouver roundtrip and circle the island chain, with stops in Hilo, Lahaina, Kauai and 2 days in Honolulu before returning on the 16-night cruise. 7. The 19-night Panama Canal cruise departs Vancouver and arrives in Ft. Lauderdale, after stops like those in Victoria, San Diego, Puerto Chiapas, Covinto, Balboa, and Orenjestad. 8. Holland America cruises offers several transpacific crossings like the one from Vancouver to Sydney that stops in Hawaii, Apia, Easo and Noumea on this 22-night excursion. 9. 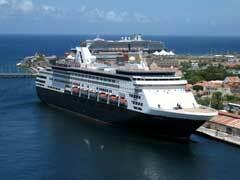 Holland America cruise deals may be had on the 14-night jaunt to the Mexican Riviera. This roundtrip from Vancouver tour stops in places like Los Angeles, Cabo San Lucas, Puerto Vallarta, San Diego and San Francisco. 10. If you prefer to stay a tad closer to home, how about the Holland America Caribbean cruise where for 7-nights roundtrip from Ft. Lauderdale, you can enjoy such stops as Grand Turk, San Juan, St. Thomas and Half Moon Cay. Holland America is voted the Best Overall Cruise Line year after year, and with itineraries like this, it is no wonder.